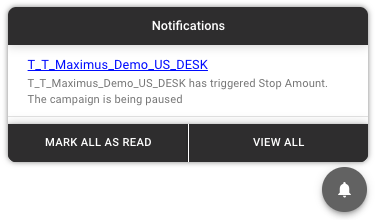 Maximus will notify users when their campaign has reached its Slow or Stop Amount. 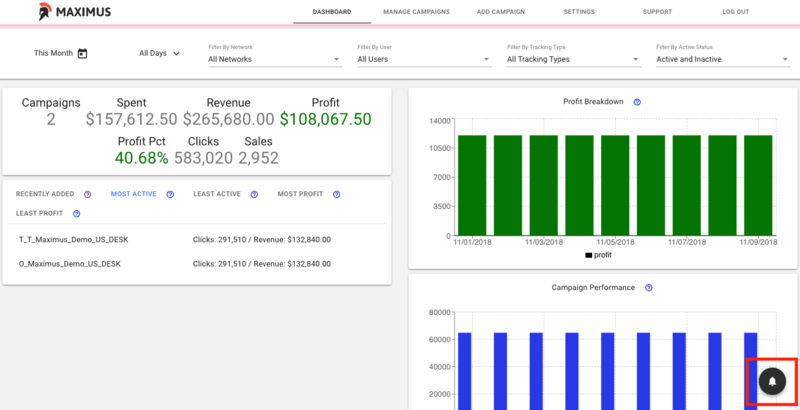 You will only receive notifications for campaigns created by your user account. The notification icon is present in the bottom right on every page in Maximus. When there is a new notification, the icon will update displaying the amount of unread notifications. Click on the icon to view the notifications. Click on the campaign name to open the campaign details page for that campaign. To mark all notifications as read, click Mark All As Read. To view all notifications, click View All. Clicking View All opens the notification page that displays all notifications. To disable notifications, click Settings -> User Settings -> User Preferences. Click here to learn more about the Settings page. From here, click the toggle and click submit. You can also enable notifications again by clicking this same toggle.